- 6 glasses of dry white Savoie Wine. - Loaf or farmhouse bread cut into cubes. Cut the cheese into thin slices. Rub garlic all over the inside of a deep earthenware or cast iron pot. Pour the wine into the pot and heat at medium temperature on the stove. When the wine boils, add all the cheese and stir slowly with a wooden spoon. 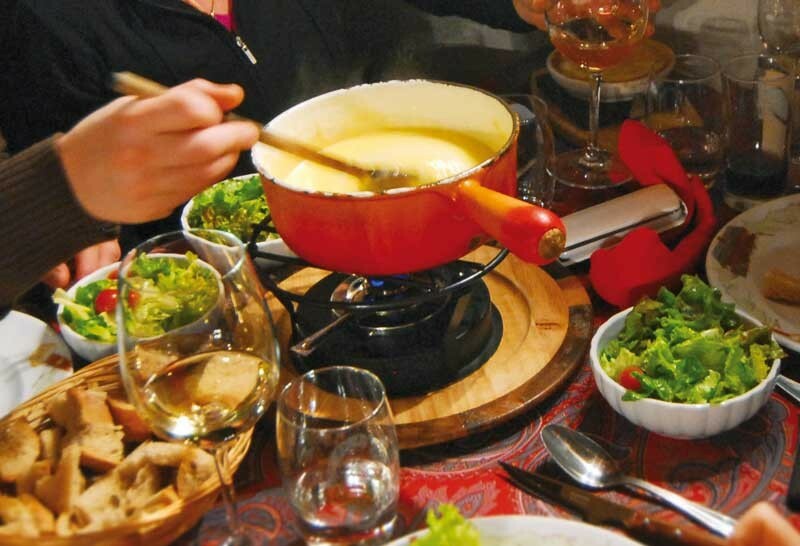 Before cheese is completely melted, put the hot pot on the fondue burner and continue stirring. Stir in the pepper and kirsch, and lower the flame when the cheese is completely melted. Each guest takes a long fondue fork, skewers a cube of bread on it, and plunges it into the fondue with a twisting movement to completely coat the bread with the cheese. Be careful to continue stirring the mixture during the meal but don’t loose your bread in the cheese! Serve with one of the Savoie’s dry and fruity white wines: Apremont, Abymes, Chignin, Crépy.